Full Sail Graphics & Marketing printed and installed the vehicle wrap for one of Huntington Beach’s most notorious groups, the HB Lifeguards! 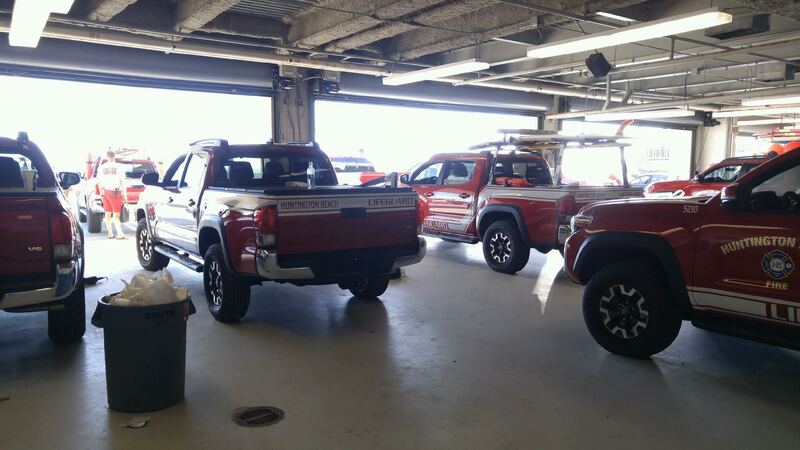 Not only did we wrap one of their incredibly distinctive, bright red Toyota trucks, but we wrapped the entire fleet of these vehicles! Our company specializes in fleet graphics and loved working with this infamous Huntington Beach group. This group of local heroes patrols nearly 4 miles of shoreline North and South of the HB Pier. Patrol is 365 days a year from dawn to dusk. Lifeguards are highly highly skilled experts in aquatic rescue and incident command. They are trained in specialized water and beach rescue in a myriad of different unsafe conditions including: near shore, offshore, underwater, tsunami, flood, oil spills and even earthquakes. Marine safety experts play a vital role in keeping Huntington Beach residents and guests safe from harm. Any Huntington Beach resident will tell you that knowing the Lifeguards are vigilant in every single tower leaves a provides a sense of comfort to beachgoers. They do their job quietly and their heroic efforts often go unnoticed. Just this past holiday weekend, Lifeguards in the area made over 3,000 rescues. The Register reported that Huntington Beach Lifeguards, specifically, made an estimated 575 rescues. On the Fourth of July this year, HB Lifeguards rescued well over 200 civilians. For kids in Huntington Beach, lifeguard training can begin as early as 9 years old with the Jr. Lifeguards program. This program has been around for over 50 years. Its aim is to educate children on recognizing hazardous ocean conditions and knowing the best way to respond to these conditions. The program teaches ocean safety, respect, teamwork, fitness, competition, and discipline. Students in this world renowned program also learn First Aid, CPR, and other lifesaving methods. Printing and installing the fleet wrap for the Lifeguards/ Jr. Lifeguards of Huntington Beach is a special occasion for Full Sail Graphics. We love the work we do, but we especially love it when we are helping those who do so much good for the city. This summer, when you see the Lifeguards trucks driving up and down the shores, remember Full Sail Graphics & Marketing had the honor of printing and installing those brilliant graphics! With over 50 years of combined experience in graphics and marketing, the Full Sail Graphics team is confident that we will deliver quality graphics on time and on budget. If you’re looking for some quality fleet wraps for your program or business, please feel free to give us a call at (714) 451-8428 or visit our website at //fullsailgraphics.com.